It was our great pleasure on a recent trip to Cannon Beach, Oregon, to be hosted by two accomplished professional chefs while they prepared a diverse four course dinner for 22, paired with excellent Oregon and Washington state wines. Chef Bob Neroni and his wife, Chef Lenore Emery-Neroni of EVOO Cannon Beach entertained and educated us throughout the evening during one of their cooking demo/interactive dinner shows, one of the most popular things to do in Cannon Beach. Their food preparation and cooking methods emphasize a sustainable farm to table approach with whole food ingredients that are locally sourced and seasonal, something we seek out wherever we travel. 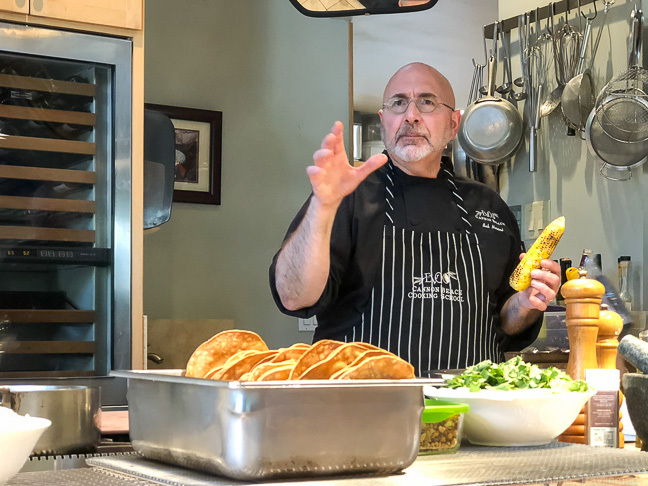 Bob was formally trained at the Culinary Institute of America and has held Executive Chef, Consultant, Educator and Director positions throughout his career in the food and restaurant industry. Lenore is a graduate of the University of Washington and the University of Maryland, with extended education at culinary powerhouse Johnson & Wales. Her love of education in food and nutrition has served her well throughout her career. 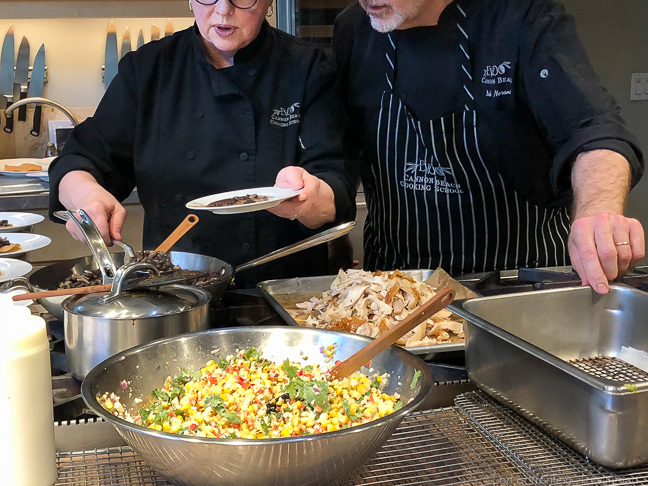 She's held faculty, Director, Advisor, and training positions, but now especially loves the hospitality she and Bob create for their guests at EVOO Cannon Beach Cooking School. With such illustrious backgrounds you might expect the dinner show experience to be a bit lofty or intimidating for the average foodie, but not so. Their passion for what they do shines through in their welcoming hospitality and ease of interaction with their guests. Seating for the event was set around the impressive cooktop with an exhaust hood that just about covered us all (we had some serious equipment envy, but the exhaust hood took the prize). 12 of us sat around the counter which surrounded the stove, and individual high tables were behind the counter which gave everyone an unobstructed view. The kitchen was specifically designed with a studio feel to give a clear view of the food being cooked and the techniques employed for each dish. We loved the overhead angled mirrors which gave everyone seated around the stove a direct view of what was happening on the stove. Prior to each dish the chefs talked about the ingredients and from where they were sourced, and the interaction with guests was easy and spontaneous. In between ongoing preparations and cooking, Bob explained his techniques and how to best use those same techniques at home. Lenore would further describe the dish and its ingredients from a nutritional standpoint, giving tips on food safety and putting a spin to Bob’s techniques, emphasizing best practices in the kitchen. It’s easy to see they’ve been doing this for some time as a couple, a fact not lost on us and our thirty years in the kitchen together. Their relaxed interaction with each other and their guests, and their bits of humor certainly added to our enjoyment. We loved watching and listening to them. Spicy Dungeness Crab Cake on a slice of fresh ripe heirloom tomato; Oregon Baby Pink Shrimp and Cucumber Salad atop avocado slices on a toasted seed-nut bread spread with cultured butter; a cup of House-smoked Salmon Chowder with pepper crackers. Coming from the east coast, we have always enjoyed blue crabs and, when in season, stone crab claws. Dungeness crab was a welcome surprise - sweet, a bit briny and complemented well by the sweet tomato. The pink shrimp and cucumber salad was very mild tasting and seemed to meld all together with the avocado and nuttiness of the bread. But the smoked salmon chowder, we could have eaten an entire bowl, not too smokey or fishy, just creamy and delicious. This course was paired with a 2017 Albariño from J. Scott Cellars, an aromatic white wine with nice acidity. We hadn’t heard of Albarino before. It was crisp and citrusy, think lemon or lime, with some softer tropical fruit flavors. It paired well with this course - perfectly balanced with the seafood flavors. Baked Cheddar Cheese Tamale-stuffed Charred Poblano Pepper atop spicy black beans on a Fresh Tostado with Brined Roasted Chicken and Housemade Ancho Chili Mole (sans chocolate); finished with grilled fresh corn tossed off the cob in lime “butter” with cotija cheese. After the seafood starter, the second course made for textural salad course that was full of flavor. We enjoyed the half poblano and the crunch on the tortilla but the star of this course had to be the ancho chili mole. It complemented the juicy roasted chicken and grilled corn so well., and added layer after layer of flavor to this vibrant dish. We're still drooling! For this course, the Chefs served a 2014 Tamarack Cellars Firehouse Red, a blend of ten different grape varieties with a lovely deep purplish color. It’s a fruit forward wine, and we found the aroma quite pleasant. It’s slight smokiness and level of tannins balanced wonderfully with the vibrant flavors of this Latin-inspired course. Twice cooked Fennel Crusted Pork Steak on Roasted Tomato Marinara alongside local Oregon-zola (think gorgonzola or other blue cheese) Smashed Red Potatoes, and a slice of Fire Roasted New Crop Apple. The Pork was roasted, then cooled and cut into steaks - it couldn’t have been better. What really made it special was the fennel, which imparted a nice flavor and aroma to the steaks. I would have liked a bit more of the cheese in the potatoes, but what was there was tasty - the creaminess of the cheese in the starchiness of the potatoes was perfect. Our favorite wine of the night, Montinore Rosso di Marchesi, is a blend of Italian-style grapes and Oregon Pinot Noir. Beautiful color, really fruit forward and jammy with a long finish, this selection had no trouble pairing with the pork and other flavors. We had just visited Montinore Estate in Forest Grove, Oregon two days earlier but hadn't tried this wine in our tasting, so we were excited to taste it with our dinner at EVOO. Backyard Black and Blueberry Buckle, served warm on lightly seasoned whipped cream, with Toasted Coconut Ice Cream and Salted Candied Walnuts. What can we say about this? It’s dessert and we both love dessert especially with a quality coffee. We had ours with a Nespresso dark espresso and it was absolutely decadent. Chef Bob is right about whipped cream - it doesn’t have to be beaten until it’s stiff. His softer version was lovely and the consistency of sour cream. We thought it was easier to add to each bite of the dessert and just as rich. This was a night to be remembered. We have been to other Chef’s cooking schools where dinner was prepared by apprentices under a Chef’s supervision. But they fell a bit short by avoiding important details and descriptions about the foods or preparations. This experience was completely different. Chefs Bob and Lenore described the ingredients of each dish, the origins of those ingredients, and how best to prepare and season each one, and further explained cooking techniques, and why they it cooked the way they did. Interaction and questions from guests were always encouraged. Watching our meals being prepared with the humorous “Bobisms” sprinkled along the way made for a thoroughly enjoyable three hour show. The Pacific Northwest coastal towns may be less well-known for their food scene as their more urban neighbors, but we think it’s one of the top food destinations in the US for the farm fresh ingredients and incredible wine pairings. Many thanks to Experience Cannon Beach and EVOO Cannon Beach for hosting us for the evening. All opinions are ours alone based on this firsthand experience. If you plan on visiting Cannon Beach, book a seat at the EVOO table. We wouldn’t hesitate to attend another of their events, and neither should you. We had a great stay at The Hearthstone Inn, just a block (2 minute walk) from the beach. 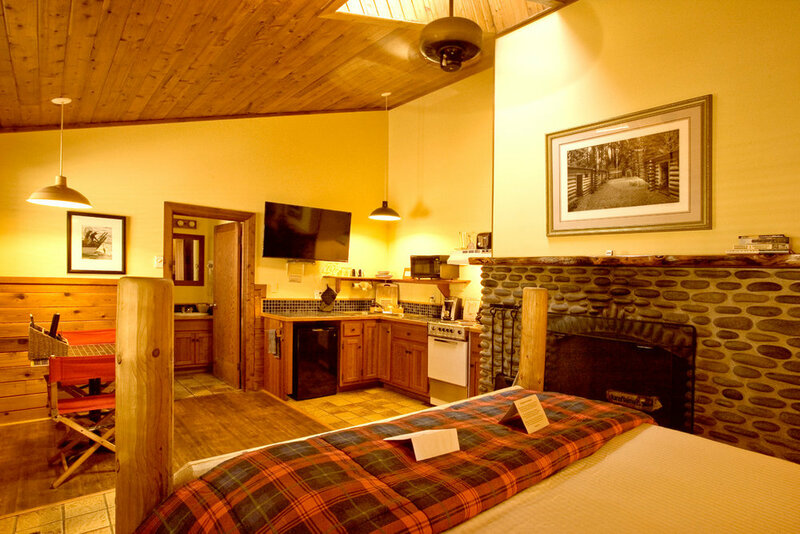 Our room had a rustic lodge look and a cozy feel, with a working fireplace (and a Duraflame log), and a small kitchenette. There was also a small kitchenette and small table for meals. A great value in a beach town that can be pricey. Check rates and availability. The Dinner Show (with 4-course meal) is $149 per person. Certainly a luxury food experience, but not because of the price. Factoring in the entire evening - from the entertaining and informative presentation and four delicious courses, to the three full glass pours of some of the best wines in the Pacific Northwest - we think it offered great value for the experience. You'll have much more fun than at a fine dining restaurant, and your home-cooking is guaranteed to benefit from your new culinary education. For serious foodies and aspiring chefs, they also offer the EVOO Culinary Internship Adventures where students of all ages can immerse themselves in the cooking industry while enjoying life at the beach.